There’s about a week and a half before semester two starts again and I have a lot of shorthand to study (read: have to, but would prefer not to). At the same time, I’m trying to use my time off to get more cooking in before everything starts getting hectic again and I had a peculiar inkling this morning to try out hollandaise sauce. Peculiar because I neither like nor have had good experiences with hollandaise. The first time I had eggs benedict was two Christmases ago when I was in Perth with Andrew and his family. We had breakfast at one of the Dome cafes, which to be fair aren’t bad. The hollandaise sauce, though, made me feel like throwing up – it was really thick, had little flavour to it and it was everywhere. A couple of others got the same dish and said it was a bit heavy but was okay. From then on I have stubbornly refused to order anything with hollandaise sauce in it whenever I go out to have breakfast or brunch. Knowing this, I wanted to start practising my hollandaise sauce making so that I can one day get it right and we can just make it ourselves. 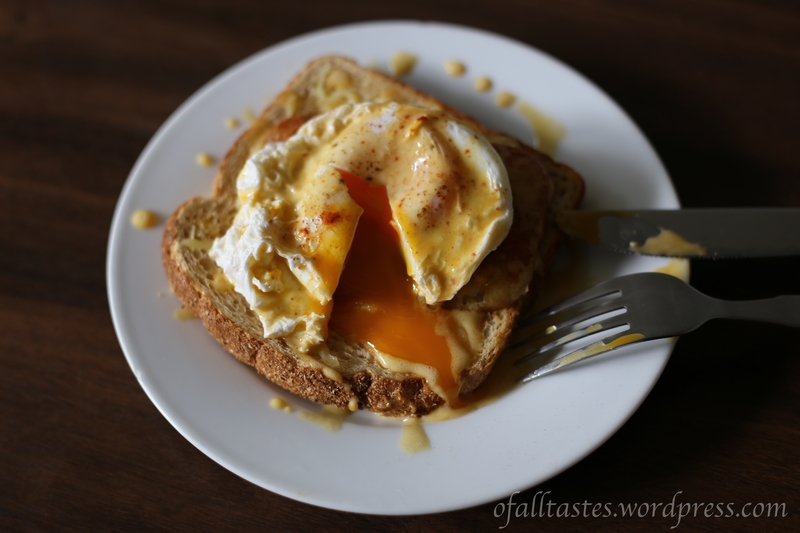 My trusty recipe book had instructions for hollandaise but I looked online and found this recipe, which I ended up following. I rejigged the measurements because I didn’t need a whole cup of the sauce. I ended up using only one egg yolk, about 1/2 tablespoon lemon juice, 2 tablespoons of melted butter and pinches of salt, pepper and paprika. The yolk didn’t scramble – woohoo! But it also didn’t really taste great, in fact I almost couldn’t taste it at all, which I’m almost 100% sure is because of how I adjusted the measurements of the other ingredients. The poached egg, on the other hand, turned out perfect so I’m pretty satisfied with my breakfast this morning even if the sauce was a bit of a non-event. It’s not complicated so I’m keen to try it out again soon! I’m one of those weird and annoying people who loves to take several photos of their food from as many different angles as possible before finally eating it – I blog about food so what do you expect?? People like me get mocked and ridiculed everywhere in society for this behaviour and I’m sure someone, somewhere has written about how this is evidence of some sort of personality disorder/evidence of narcissism (aren’t we all a little bit narcissistic?). But, I don’t actually care because I love it: I love food, I love taking photos of food and I love showing it all off. Some sort of egg thing. 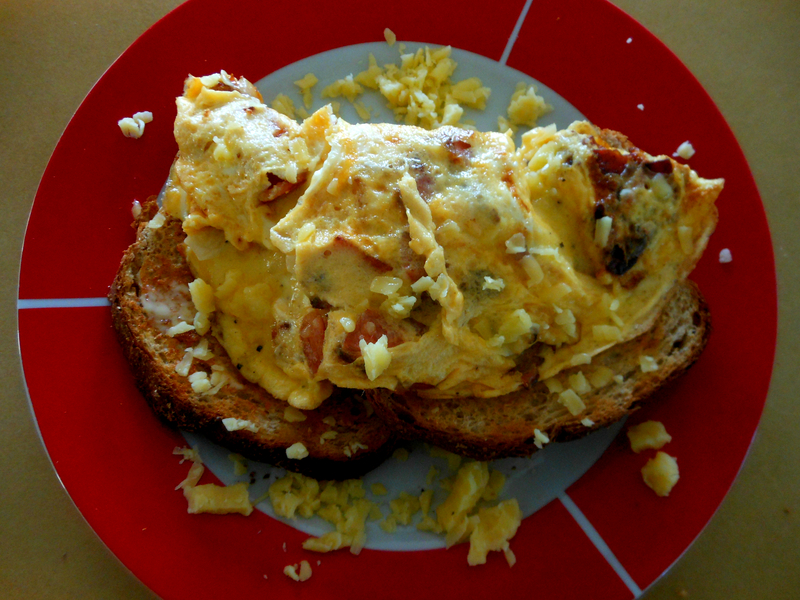 Pretty much started with fried eggs but decided I didn’t want fried eggs anymore so scrambled them up instead. 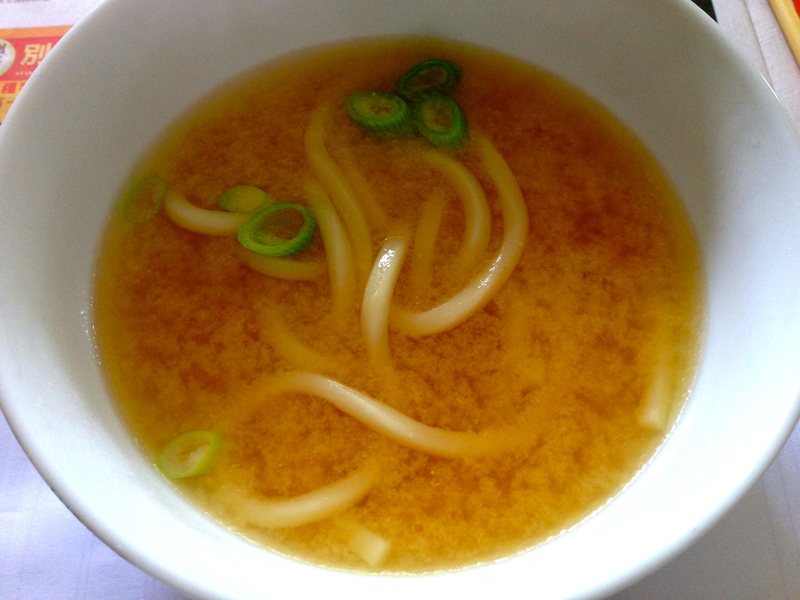 One of my absolute favourite things to eat: udon noodle soup. It’s incredibly easy to make as well. Water, stock, noodles, soy bean paste, spring onions, done. If you really wanted to make it fancy you could even cook up some tofu and chuck that in there too. 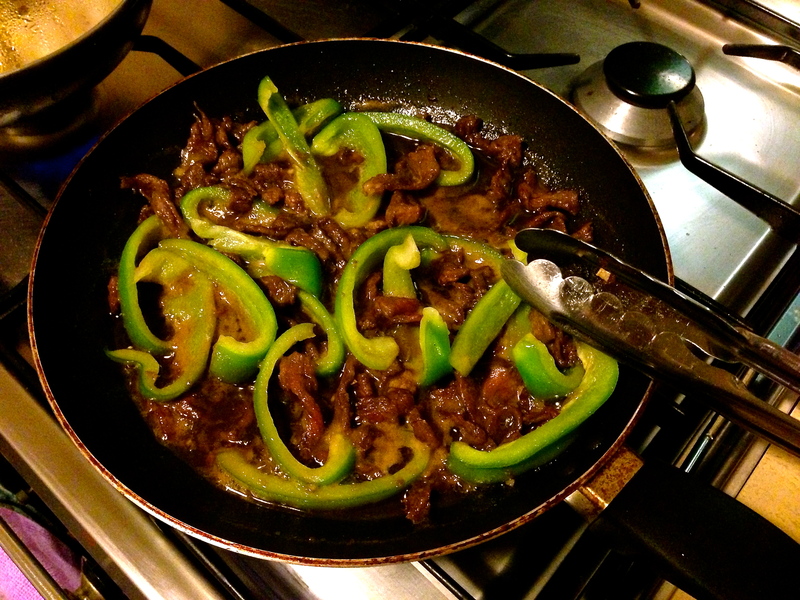 Teriyaki beef strips and capsicum. Yeah, I like Japanese food. 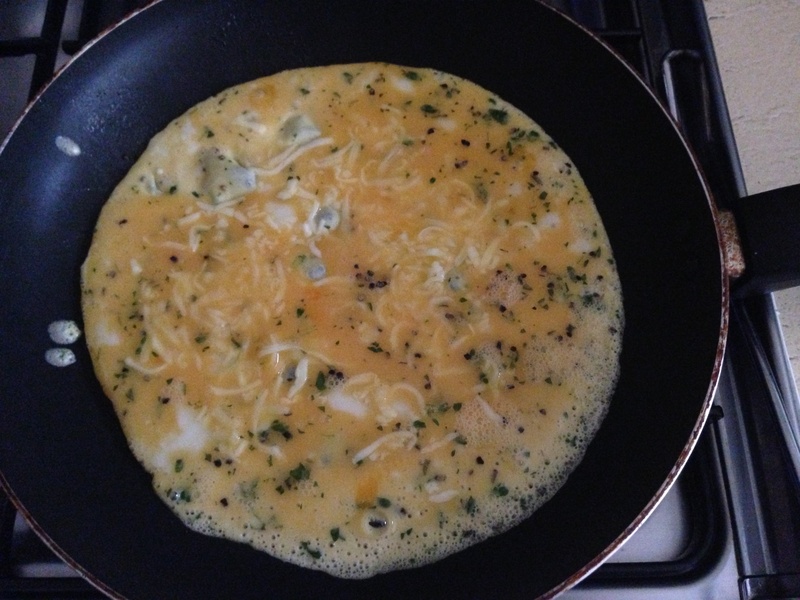 Two-egg omelette with cheese, thyme and a bit of seasoning. Random, but tasted good to me! We’ve been in Perth for a little over a week and this morning was probably the first time I made any significant effort to cook a proper breakfast. Andrew loves eggs so I chose to make an omelette with bacon, onion and cheese. I’m not a huge fan of eating out for breakfast and I had no idea what an omelette was supposed to look like, nor any idea as to its texture, when I made my first one based entirely on a recipe out of one of my cookbooks. I’ve realised that there are different omelette variations and with many dishes, it’s as much about putting your own touches to it as it is about cooking it “right”. Fillings aside, there are a number of preferences on whether to add water, cream, milk or nothing at all. Personally, I prefer not adding anything in at all and I also prefer not to have the middle runny, not even slightly. Call me strange but something about runny eggs makes me want to gag, especially undercooked egg whites. 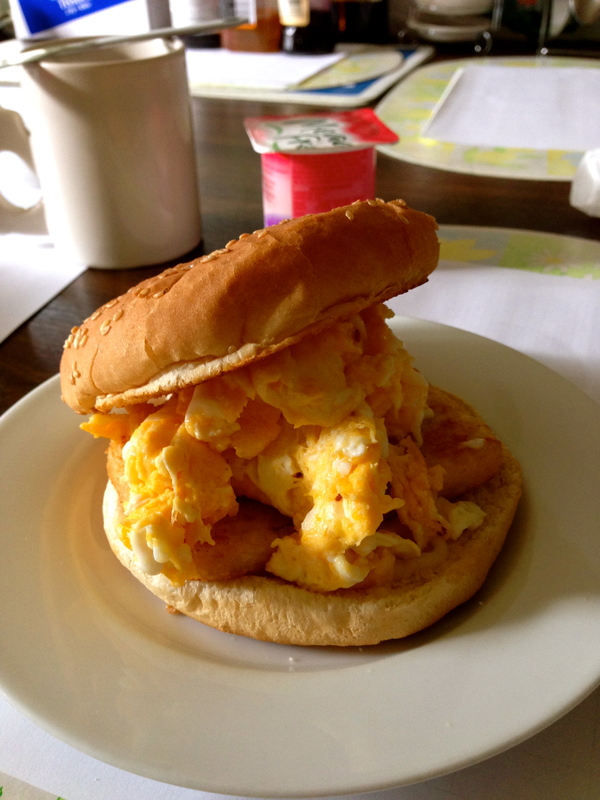 This one, though, was slightly underdone in the middle since Andrew prefers runny eggs. A perfect omelette? Not sure. Tasty and a good meal? Definitely.